Republican Eric Leutheuser wins the 58th State House District in Hillsdale County, taking 76-percent of the vote. Democrat Mary Hamaty had 24-percent. Republican Julie Alexander wins the 64th State House race in Jackson County, with 63-percent of the votes. She beat out democrat Ron Brooks, who finished with 37-percent. Alexander is replacing republican Earl Poleski, who is term limited. Incumbent republican Brett Roberts wins the 65th District race in Jackson County. 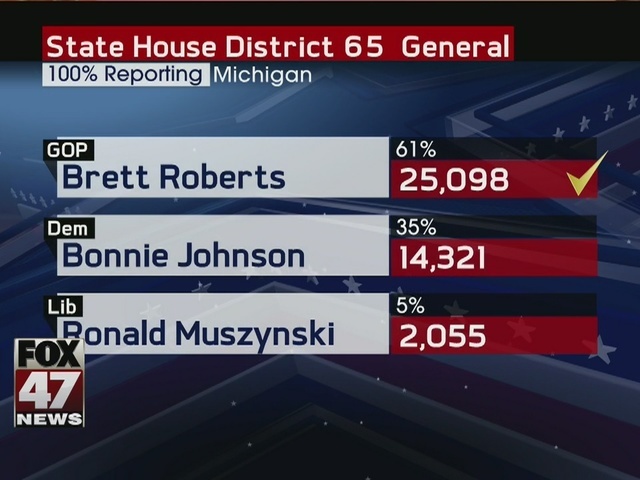 Roberts took 61-percent of the votes. His challenger, democrat Bonnie Johnson had 35-percent.